Why ‘The People Side of Innovation?’ Because where innovation fails, its generally not due to an issue of proceedures or systems, but rather culture. Successful innovation, the the type of innovation that enables an organization to move forward producing one breakthrough innovation after another, is founded upon a culture that values innovation as a strategic advantage. Such organizations, create and foster a ‘culture of innovation,’ as a core organiational belief and value. It’s not an ‘add-on’ program or fad, but rather systemic to the very heart of the organization. 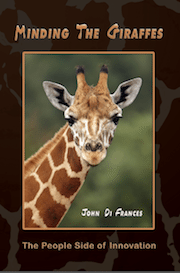 Minding The Giraffes is a book written about natural innovators, who they are, how they view their world, how they do their ‘magic’ of innovating and importantly, how the organization’s executive leaders and senior managers can and need to support and encourage them. Everyone can be innovative, but just as in every other discipline, sales, finance, marketing, accounting… some people are born with a natural gift for innovation. They see their world differently. Much differently than those around them. They can literally ‘see’ opportunities to innovate that others cannot. It’s simply their ‘gift.’ Equip, empower and support them with an organizational culture of innovation and not only will they amaze you at the innovative genius they will employ to create internal and marketplace breakthroughs, they will also inspire and motivate those around them who are not natural innovators to begin to ‘see’ strategic opportunities that were previously unrecognized. 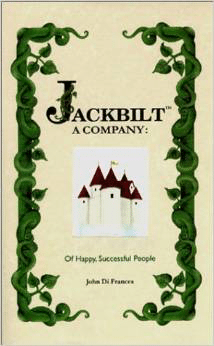 JACKBILT A COMPANY is an allegorical tale John wrote to meet the needs of managers and Human Resource Departments, faced with integrating into the workforce employees who missed ‘Everything They Should Have Leaerned in Kindergarten.’ Unfortunately today, there are large number of people who are employed within our organizations who simply never learned the fundamentals of working getting along with others. John firmly believes that those leaders who seek to build their organization upon a solid ethical basis, are buillding for the future. RECLAIMING THE ETHICAL HIGH GROUND, compares organizations that are highly ethical with those that aren’t. The comparison is stark. 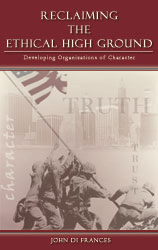 To obtain single or multiple copies of RECLAIMING THE ETHICAL HIGH GROUND, contact us. John’s Newest Book – CEO’s Guide to Strategic Planning will be released in early 2016. If you would like to receive notice of its availability when released, use this link to contact us and place the words Strategic Planning Book in the title. John also co-authored Electronic Bids & Proposals: Federal Government Contracting with Dennis Riley. United States Federal Government Contracting – Use of electronic bids (IFB) and proposals (RFP) in defense and civilian contract awards under U.S. law and the federal Procurement Regulations (FAR and DFAR). This 1996 book by Federal Publications is out of print.